IADLEST has created a revolutionary program designed to eliminate many of problems associated with a lack of standardization within police training. 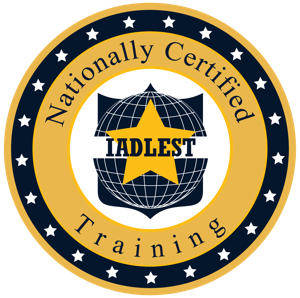 The IADLEST National Certification Program (NCP) sets minimum standards for vendors providing police continuing education and ensures training content meets those quality standards. The standards are designed to meet or exceed any individual State certification requirements thus ensuring that IADLEST certified training will be accepted by all participating POST organizations in the Nation for training credit. When did the National Certification Program launch? On June 1st, 2015 the National Certification Program launched at the yearly IADLEST conference held in San Antonio, Texas. A panel of experts answered questions to help the audience understand this National Certification. The announcement and the panel were broadcast live on a webcast to and additional 250 people around the world which can be seen at http://webcast.iadlest-ncp.org. Where is the webcast of the NCP launch? You can find the webcast of the panel explaining the NCP at http://webcast.iadlest-ncp.org. The below information is reflective of the current training provider requirements for the NCP. For information on alternative models, please contact Mike Becar directly at 208-288-5491. On August 27, 2015 the IADLEST Executive Board met to discuss the current policies surrounding how courses could be housed online, how records will be maintained for officers, and how courses which are certified can utilize the IADLEST Seal for their Certificates of Completion. To benefit as many providers as possible and to ensure training data is being collected for the officers’ portable training record, the following policies were discussed and approved. Why should I submit my training materials for national certification? Training providers and content developers should want to know their training materials have been reviewed by content and instructional design experts and are accepted on a national level by POST Directors throughout the United States, thus granting participating students the credit they desire to maintain their professional licensing requirements. Students will gain confidence in the provider’s courses and reputation as they choose from the myriad of criminal justice training programs being offered, both in a traditional classroom setting and electronically. In addition, law enforcement and other agency chief executives will have confidence in the training curriculum being offered which will inspire them to send their students to nationally certified training. Earning the IADLEST seal guarantees your product has met the nationally acclaimed best practices and will also help with your training program marketing strategy. How do I submit materials for review? What types of documents do I need to submit for review? Recommendation letters from at least three individuals who have attended your training in the past 6 months. Currently, your lesson content review should take less than 30 days. However, we can expedite your training request, if needed. What does the National Training Certification process cost? $65 per training hour for in-person training. This charge helps us pay to have your training program professionally reviewed and assessed for National Certification. Training receiving a passing score will receive the IADLEST Seal of Excellence. How do I know my content is protected? Prior to any requested reviews, all IADLEST reviewers sign agreements with clear “Non-disclosure” clauses. The “Non-disclosure” prohibits reviewers from disclosing or profiting from ANY information or content they receive as part of this program. Additionally, the end-user license agreement (EULA) on FirstForward prohibits unauthorized use or distribution of content. National Certification is good for a period of two years. How much is it to renew the certification after the two years? The fee for renewal is the same as the initial fee to go through the certification process. See the costs above. Can I market my course as IADLEST certified? Are there other requirements for being certified? Yes the following list lays out a few more of the requirements: The National Certification Catalog will contain all IADLEST certified training. Online providers must host their content in the National Training Catalog on FirstForward®, however they may also host IADLEST certified content on their own Learning Management System (LMS). All Providers must have an account on FirstForward®, which provides the framework for the IADLEST National Training Catalog. All courses being certified must have a separate entry so they are included in the National Training Catalog. All courses must include a name, description and image while In-Person and Classroom courses must provide location, time and a link for more information about the training. Portable Training Record will house all student records for completed training. *IADLEST is offering an incentive for online providers who support the National Portable Training Record database. Providers, who submit their complete (certified and non-certified completion records) officer training data to the database via an initial training data upload to FirstForward®, will be allowed to “grandfather” officer records for those individuals submitted. No fees will be assessed for these officers’ certified course records submitted for a period of 3 years. **We believe providers have the power to provide an invaluable service to the industry by helping IADLEST to create the most comprehensive and portable National training record for officers. What are the Provider Roster Fees? The following is the fee structure for an individual provider. The costs are broken down by type of course and deliver mechanism. A provider will pay no additional fee for any online course taken through the National Training Catalog on FirstForward®. IADLEST certified online courses taken from a provider’s LMS by 10 students in a particular month will cost the provider $25.00. This fee supports the generation of student accounts, IADLEST certificates, student surveys and annual hosting of the record. If in the next month 20 students take a different IADLEST certified course from the same provider where 10 of the students had previously taken an IADLEST certified course. The provider’s cost will again be only $25.00. The charge will be for the 10 new students who had not been previously reported at least once within the year. A 10 hour IADLEST certified classroom course which has 10 students completing the course will cost the provider $5.00/student ($2.50 + $0.25 x 10 hours). The fee for the provider would be $50.00 to add the 10 student records to the NCP framework on FirstFoward®. This fee supports the generation of student accounts, IADLEST certificates, student surveys and annual hosting of the record. If one of the same students were to retake the same course or take another 10 hour IADLEST certified course from the provider it would cost them an additional $5.00 for the student to provide the information and obtain the official IADLEST Certificate of Completion. Why should I signup now? By signing up you will have access to the new National Catalog and will be notified as new certified courses are ready. We will constantly have several online and classroom based courses in some stage of the application or certification process so being on the platform will be the best way to know when there are more course ready. Also, actively participating will help to grow the program and help to truly make it a National certification. Will I be able to assign courses to my officers from the catalog? Yes. When you find a course which you would like your officers to take you can acquire and assign directly from the catalog. After all of your officers are added to the platform you will be able to select the individuals you would like to take the selected course. What is this portable training record about? An estimated 125,000 officers change jobs each year, and almost 20% of those move to a new state to accept their next employment. Both the officer and the out-of-state agencies endure administrative headaches that arise when re-evaluating training the officer has already completed. When an officer completes a course through the National Training Catalog, the outcome will automatically be added to the officer’s portable training record. This will save both time and money for everyone involved. Why should I become a training program reviewer? Training Program Reviewers are the backbone of the IADLEST National Certification Program (NCP). This professional group is responsible for assessing the content and instructional strategies used in criminal justice training programs. Reviewers are professional, knowledgeable, experienced, and committed to ensuring the training programs submitted for review comply with national standards for training excellence. What qualifications do I need to become a training program reviewer? Reviewers are generally recognized as a state and/or national expert in a specific law enforcement/criminal justice subject or topic. They come from law enforcement training academies, colleges, universities, law enforcement agencies, correctional academies, public safety offices, or other investigative entities. Many are certified as court experts in their topic areas, experienced trainers, and instructional designers. They should have recognized content expertise and a significant background in criminal justice training, as well as three professional letters of recommendation attesting to reviewer’s specific areas of expertise. A recommendation from a state POST Director is highly desirable. How do I become a training program reviewer? How long will each review process take? Currently, lesson content review should take less than 30 days. However, there may be expedited training requests to respond to. How are training program reviewers trained? IADLEST has developed a training program required for all new reviewers that will familiarize them with the assessment matrix and their roles and expectations. How are training program reviewers compensated? Reviewers are compensated for their review of both online and traditional classroom learning content. Reviewers are paid $30 per accredited hour for an online delivery review, and $15 per accredited hour for in-class delivery assessment. Can I work as a training program reviewer on or off duty from my regular responsibilities? You will need to check with your current employer to make that decision. Many staff members review content on their own time, after hours and weekends, and are compensated by IADLEST for doing so. If your POST agency or employer permits you to work on program content while doing your other work functions, then that is permissible; however IADLEST cannot compensate you too. In other, words, you may not “double-dip” and get paid twice for the same hours.